Here is a picture of several Haitian Children being taken into immigration custody in the Bahamas without their parents. One can imagine what is going on in the mind of these innocent children as the see authorities taking them to an unknown place without their loving parents. These children were born in the bahamas by Haitian parents with no status. 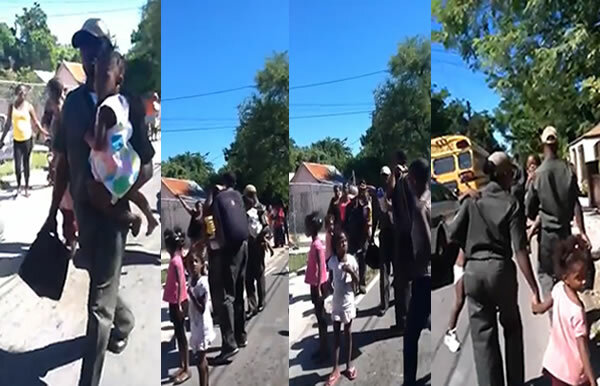 As a result, these children are citizens of the Bahamas but are treated as illegal immigrants, just like their parents. They are taken into immigration custody. The new Bahamian policy that so widely affects the Haitian population living there is reminiscent of the country's history of xenophobic behavior towards foreigners in general and Haitians in particular. The recent raids to round up illegal Haitians in the Bahamas was similar to the 1967 clamp down undertaken by the government that led to the deportation of many Haitians. The potential impact for the Haitian community there now will be vast, as, in the capital of Nassau alone, some 50,000 Haitians reside.